Wassup hotties. I'm Ramona Champion. 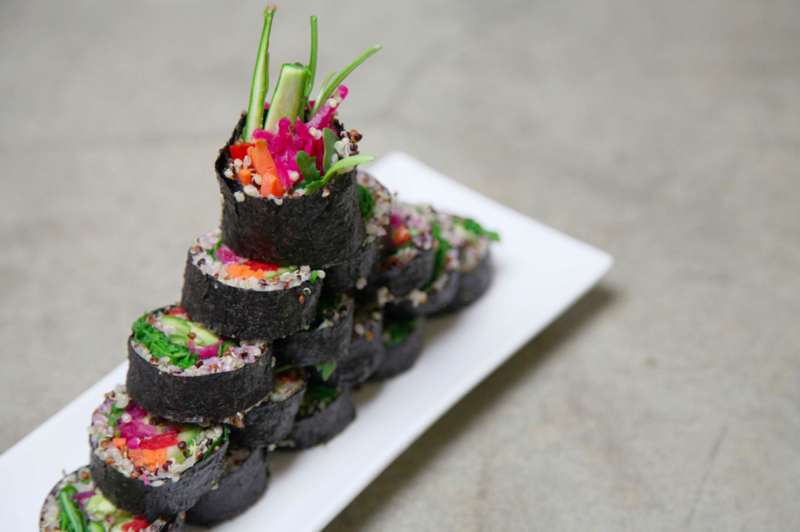 Today I shall teach you how to make my meatless, gluten-free, kimchi kimbap. The traditional kimbap requires cooked veggies. The only thing you need to cook in my recipe is the quinoa. I like my veggies raw at their highest nutrient-dense state. Let’s go make our goodies. I’m hungry. And I know you are, too! Prepare your ingredients. Use your ninja skills. First time cooking quinoa? It's similar to preparing rice. I like to use 1 cup of dry quinoa, rinse, put it into a pot and add 1 1/2 cup of water. Put the lid on and turn on the heat. Once the quinoa water boils, bring down the heat and let the quinoa water simmer for 15 minutes. Turn off the heat and let it sit for 10 minutes. Remove the lid and let it cool down. Feel free to fluff up the cooked quinoa with a fork. Do so gently so you don't scratch your cooking device. Unflatten your bamboo rolling mat on a flat surface. Place 1 sheet of dry seaweed on it. Once your quinoa is at room temperature, put on a thin, even layer on the seaweed (the top 1/3 should be left blank). You should not be able to see the seaweed through the quinoa layer. Now we set our veggies on the quinoa. The order can be important. I always like to set the structured ingredients first (the most rectangular and solid, such as bell peppers). Then the puffy, airy ingredients (arugula and parsley). Then I layer on the flexible, juicy and heavy ingredients (avocado and kimchi). If you put the puffy ingredients on first, the layered veggies above may collapse. It's normal to have some ingredients leftover. Please do not be overly ambitious and put them all into your seaweed sheet! Unless you want to eat your kimbap like a taco. Let's roll! Pick up the bottom end of the seaweed sheet and swerve it inwards. We're creating a cylinder. 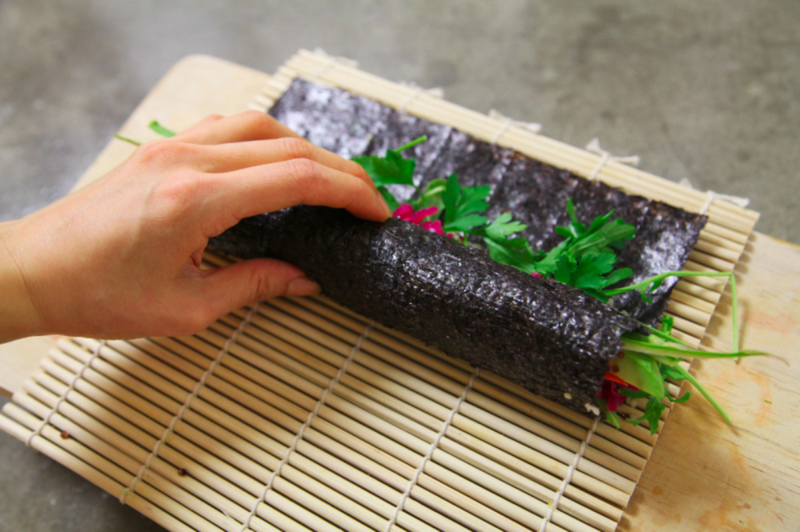 Make sure the roll is tight enough that the seaweed sheet is hugging the ingredients with just the right amount of love. If the sheet is hugging too hard, your kimbap will explode. Place your pieces on a plate and enjoy your kimchi kimbap! Have fun decorating your dish.